Anyone seeking exposure to very small companies on the UK stock market via the funds route should look at LF Livingbridge UK Micro Cap Fund (GB00B55S9X98) which has a great record of outperformance. Managed by Ken Wotton, it has generated annualised trailing returns of 17.35% and 20.85% on a three year and five year basis respectively, according to Morningstar. The brains behind the fund is asset manager Livingbridge, which looks after around £2bn of assets across its private equity funds, two UK equity funds and the Baronsmead venture capital trusts (VCTs). Wotton benefits from the investment expertise and contact books of a team of 50 investment professionals. ‘We’re all looking at small, UK growth companies and we all invest in the same four core sectors,’ he explains, namely TMT (tech, media, telecoms), business services, healthcare and education, and consumer markets. These sectors are consistent across the whole firm, where it has 20 years’ investing experience. ‘That’s a huge amount of knowledge, insight and relationships in those sectors that we can call on to generate ideas, evaluate companies and monitor investments once we’ve made them,’ explains Wotton. ‘We believe in small cap, where the market research coverage is very low and where there is pretty limited information on public market competitors and peers, having the resource internally and the network behind it is a way that we can do our own fundamental research on the companies. 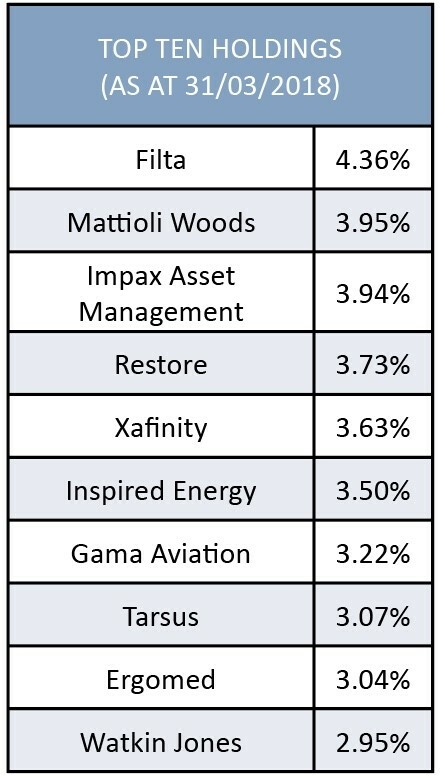 Top 10 portfolio positions include an eclectic bunch of names. These span deep fat fryer cleaning specialist Filta (FLTA:AIM), pensions consultant Mattioli Woods (MTW:AIM), private aviation play Gama Aviation (GMAA:AIM) and environmentally-friendly funds specialist Impax Asset Management (IPX:AIM). Wotton describes his investment style, which enables him to whittle down a universe of some 1,200 companies in the sub-£250m market cap space to a portfolio of 43 holdings as at 30 April, as GARP (growth at a reasonable price) but with a quality overlay. ‘We’re long-term fundamental investors. We’re looking for businesses that can grow their profits materially over the life of our investment which will typically be a four-to-five year holding period and in some cases a lot longer than that. Wotton avoids mining, oil and gas, banking and insurance companies and also rules out early-stage businesses. The fund only invests in profitable companies; and profits and cash generation are key criteria. Launched in May 2009, the fund has performed well in good markets and poorer markets alike. ‘In 2013, which was a very strong year for small caps, we had a fantastic year,’ he explains, ‘but the portfolio also generated positive returns in 2011 and 2014, years when the small cap sector was down. ‘In a very strong year for small caps, we’d typically perform in the middle of the pack. If mining and oil and gas have a stonking year, that’s going to be a relative performance headwind for us. But we’ll make it up in years where there’s a more challenging environment. Despite the well-documented challenges facing the retail sector, LF Livingbridge UK Micro Cap invested in the November 2017 stock market flotation of Footasylum (FOOT:AIM). The fund manager calls it a market share growth story. ‘It is just a very focused and well-run business. It was founded by the original founders of JD Sports (JD.) and the daughter of one of the founders is the current CEO, Clare Nesbitt. We think she is a high quality CEO and on top of the business. His patience in holding Impax Asset Management is beginning to be rewarded with the shares having nearly doubled in value since last summer.